So, today I wrote a massive 1.1k on Doom. As far as I know, that still puts me ahead of the 50k goal. I'm trying to be happy about that rather than descending into Doom and Gloom over the fact that I'm 6.7k behind my personal goal at the moment. It's not like I can't catch that up. That was close. My virtual foot was about to step onto virtual thin air and then it was down, down, down into the Abyss of Doom and Gloom. The only way out of that place is to walk along the floor of the abyss until the floor rises and the walls are low enough to be able to climb ever so painfully to the surface. Okay, easy on the metaphors, Siana. It's his fault. He's the one who said nobody was ever going to use him as the poster child for sanity. Daily blogging is proving almost therapeutic this month. Instead of lurking around various writing forums and mourning the lack of company I come here and damn well try to find some of the happy kind of crazy so I can write a not-pathetic blog post. I've made it through eight days of Camp NaNoWriMo so far and although I've ended up depressed enough to dump Liquid Story Binder again, I'm still writing and I still think I can get this story finished. I don't know for sure if I can finish it in June, but that's all right. I can just continue in July, making up a composite wordcount of Doom and Darkness. If the two of them together doesn't make enough words, I can fall back on my still-incomplete space adventure. Of course I have an incomplete space adventure. Who doesn't have one of those lying around? Mine is just over 75k at the moment and I still haven't even started the galaxy-wide war that my main characters are supposed to stop. I think it's going to be a long story, that one. In fact, in the schedule I abandoned I'd quite happily put it down for an additional 50k in October and 30k in December. I'm thinking of chopping it up into a series of 10-15k 'episodes', though, and I haven't quite decided if I should start doing that now or if I should bash my way through the whole draft before taking out the knife. Anyway, that's enough word-vomit for one day. Especially since I just typed 'bomit'. Brian does that, right? Er... typing errors. Brian <=> brain. I'm thinking about some kind of battle between 'Brian' and Scott, my muse and favourite piece of imagination candy. Scott looks like he could do some damage at the moment. He always seems to get cranky when I immerse myself in Toby's universe. For anyone who's on JanNoWriMo, you can read about Scott in my PPT. Okay, since my brian/brain doesn't seem to want to stop, I'm going to get a snack and see if I can get the same effect (i.e. large amount of words) in my novel. Camp NaNoWriMo Day 16: the end...? 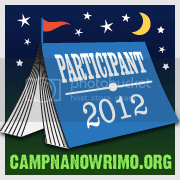 Camp NaNoWriMo Day 15: rest and relaxation? Camp NaNoWriMo Day 7: get that bunny out of here! Camp NaNoWriMo Day 6: help?